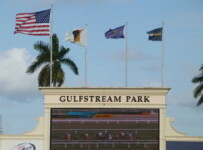 Gulfstream Park this week is changing to a four-day live racing schedule of Thursday through Sunday. First post time is 1:15 p.m. unless otherwise noted. Since last December, the Hallandale Beach track also had been racing on Wednesdays. Gulfstream’s Thursday through Sunday schedule will be in effect through Oct. 2. It will have racing on two Mondays in that period—July 4 and Sept. 5, which is Labor Day. Gulfstream’s spring meet will end on June 30. It will hold its summer meet from July 1 through Oct. 2. From Oct. 5 through Nov. 27, Gulfstream will hold its annual Gulfstream Park West meet at Calder—with racing Wednesdays through Sundays. Gulfstream will return to its home track to start its 2016-2017 championship meet on Dec. 3.